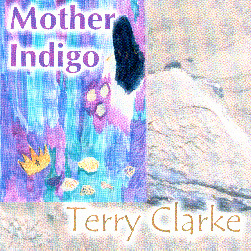 A master storyteller with an uncanny ability to sing stories about characters and places he's known, veteran singer/songwriter Terry Clarke pours out sketches of his life and times with his new collection of songs "Mother Indigo." Not since Springsteen's "Nebraska" has an artist been able to convey so much with just guitar/vocal arrangements. Despite a long history of making music professionally "Mother Indigo" is the Clarke's first CD to be released on an American label. Growing up in England and Ireland, Clarke has already chronicled many of his youthful remembrances in earlier albums, most notably on "The Shelly River," which was released only briefly on a small European label. "1994 had been a good year. In March I'd gone to Austin, Texas and had travelled out west with Butch Hancock and Jesse Taylor for a river trip on the Rio Grande through Santa Elena canyon. On returning home I toured Ireland for a month with Henry McCullough, a few weeks later Henry came over and we played some shows in England and Scotland after which the two of us went to Canada for some dates. October saw me reunited with Butch along with Rosie Flores and 'Slim' for a month long tour through England, Scotland, Ireland and most of Europe. I'm telling you this because most of these songs grew in one way or another on all of those roads. November found me without a record contract, a lot of new material and a 1963 Gibson B45 12-string guitar that I'd picked up the previous year and was really excited about recording with. So, a cold, damp, late autumn night saw Terri Hooley and me load up my coffee coloured 1980 Ford Cortina, which I managed to keep on the road until 1995 (had it stolen...got it back), and make an album."